Nowadays, people prefer to live in housing societies. It is mainly because of facilities available in any particular and advanced housing society. People feel the ease of living by availing that advanced services of communities like top class schools, state of the art hospital, shopping malls, high-level security, etc.On the other hand management of the housing societies have lots of work to do to manage the daily affairs and needs of people. Take the example of complaints management, what you think how to keep the record of people complaints? It looks little complicated, but what you feel if someone says I have a software which manages people complaints, keeps the record of any query and shows its status if it is solved. Definitely, as a management staff, you feel relax. So in such cases, you need an efficient housing society management software which can manage all your daily affairs with ease. There are lots of online society management software available that offers an extensive range of features. But you have to choose that software which is more reliable, up to date and according to your requirement. Here are few points you should be aware of when getting one. These features would help organize and streamline important activities concerning apartment society administration to a great extent. The user interface is a very critical factor of any software designs. If a software has a good UI/UX, then it should easy to use and most beneficial. Reliability of a housing society management software depends on its navigations, used technologies and its functionalities. You should check for such glitches before getting it. 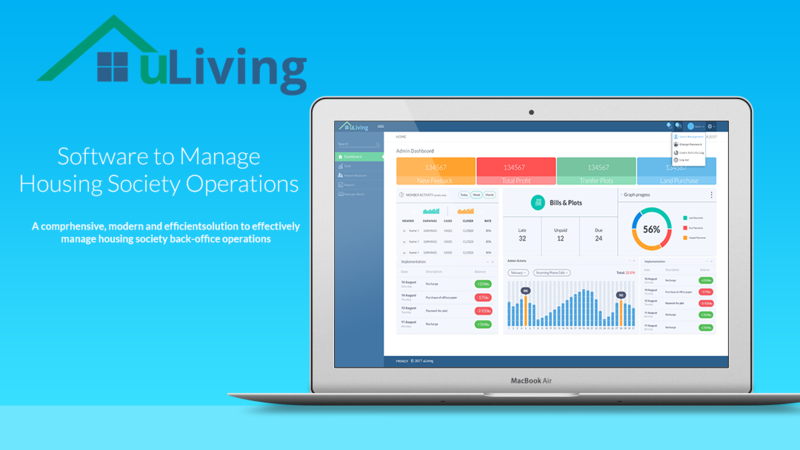 uLiving is an only housing society management software in Pakistan that come with all features mentioned above and also have a user-friendly interface. it is an efficient software in order to manage tasks, documents, and bills at one go.